by Miller, Roger LeRoy; Benjamin, Daniel K.; North, Douglass C.
For principles of economics, public policy, and social issues courses. The Economics of Public Issues is a collection of brief, relevant readings that spark independent thinking and discussion in principles of economics and social issues. The 20th Edition encourages readers to apply theoretical discussions to today’s important issues to gain a deeper understanding of current microeconomic policy concerns. 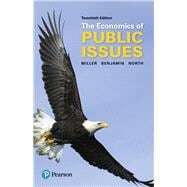 Readings are concise, allowing for easy integration into any principles of economics or issues-based classroom. A correlation guide in the preface illustrates how to integrate topics into different courses. Conversational and informative non-technical writing is geared toward principles-level students and does not require advanced math. Using the latest debates in social policy, the authors encourage readers to question their own assumptions and the analysis offered by the media and politicians on key issues. End-of-chapter questions offer students the opportunity to test their knowledge and review chapter concepts. Roger LeRoy Miller received his PhD from the University of Chicago. Miller is a legal specialist and author of numerous books on law and the legal environment, including criminal procedure. In addition, Miller has authored books on the war on drugs, the economics of crime and criminal behavior, and on related topics. Daniel K. Benjamin is an Alumni Distinguished Professor in the John E. Walker Department of Economics, Clemson University. He graduated Phi Beta Kappa from the University of Virginia and completed his PhD in economics in 1975 at the University of California at Los Angeles where he was a National Science Foundation Fellow. Benjamin has taught at Montana State University, the University of Washington, and the University of California at Santa Barbara. He is Alumni Distinguished Professor Emeritus at Clemson University. 3. Flying the Friendly Skies? 9. Are We Running Out of Water? 12. (Why) Are Women Paid Less? 17. Coffee, Tea, or Tuition-Free? 25. What to Do About the Climate?